In-car connectivity systems are fantastic pieces of technology, offering anything from reading aloud your text messages and taking dictation to streaming music from your phone. They’re not new systems, however, and given the time lag between the arrival of a new car and the rapidly advancing technology, they’re often not the most up to date when they reach the market. The other issue is ease of use – with the phone having to use the car’s system and each car company offering its own, usability ranges from the simple and completely intuitive to the close to unfathomable. However, they’re about to get a whole lot simpler (and smarter). Apple and Google have taken their battle for consumer hearts and minds to the road with the announcement of Apple CarPlay and its arch rival Android Auto. These new systems are essentially mirror screens of your Apple or Android smartphone, projected on to the car’s touchscreen and offering easy to use and familiar touch, voice or button controlled systems. For instance, drivers will be be able to use the maps feature on their phone via the car’s touchscreen, and the voice button on the steering wheel to tell the phone who to call. Apple says its system ‘gives iPhone users an incredibly intuitive way to make calls, use Maps, listen to music and access messages with just a word or a touch’. 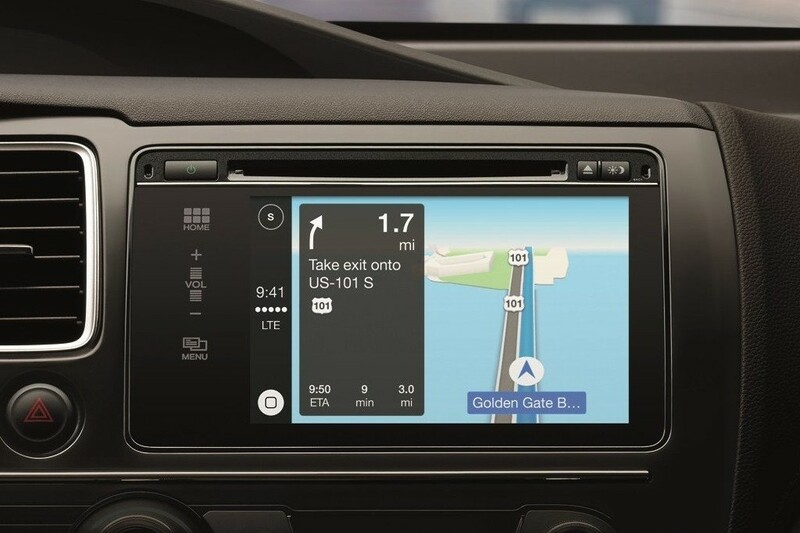 Apple’s Greg Joswiak said that CarPlay has been ‘designed from the ground up’ to give drivers ‘an incredible experience’ using their iPhone in the car. He also says that CarPlay lets drivers use their phones in the car ‘with minimised distraction’. As well as Apple’s core functions, CarPlay also supports apps such as Spotify and iHeartRadio. Ferrari, Mercedes-Benz and Volvo are the first manufacturers to offer Apple CarPlay, while BMW Group, Ford, Opel, Honda, Hyundai, Jaguar, Land Rover, Kia, Mitsubishi, Nissan, Peugeot, Citroen, Subaru, Suzuki and Toyota have all signed up to the Apple system down the line. Apple CarPlay is available in compatible vehicles as an update to iOS 7 and works with Lightning-enabled iPhones, including iPhone 5s, iPhone 5c and iPhone 5. Meanwhile, people who use the Google Now ‘OK Google’ voice commands on their phones will find a more advanced version on Android Auto. 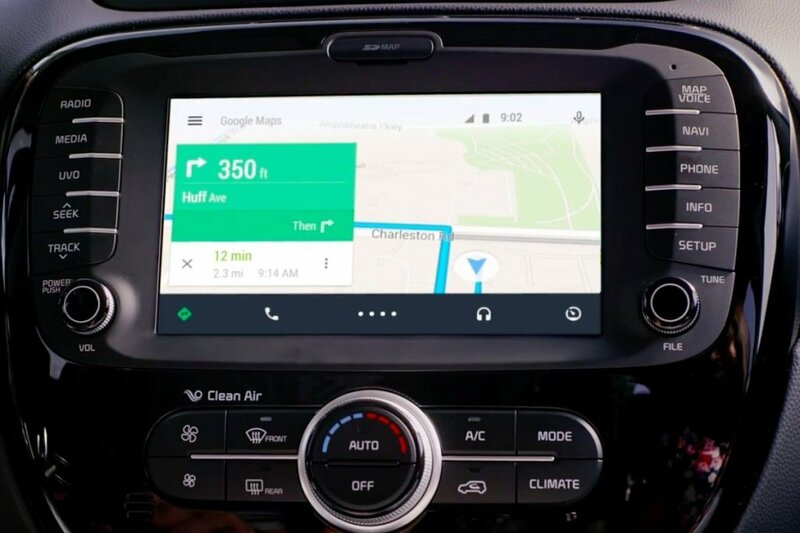 This system offers turn-by-turn navigation from Google Maps, curated playlists and radio stations through Play Music, easy to use voice search, as well as reminders from Google Now – all accessed via your car from your phone. Google also says its system is designed to minimise distraction and ‘is far safer than fumbling around with your phone’. It described cars currently as ‘fundamentally disconnected vehicles’ and said that it has partnered with motor companies and technology partners to ‘figure out the best way to bring Android into the car’. Android developer Henry Newton-Dunn adds: ‘We focused it down to the controls the driver really needs within the driving space. ‘We’ve made Google apps really easy to use for the car. We’ve got nice easy to access touch targets and a simplified interface. Some 27 of the world’s major car manufacturers, including Ford, Volkswagen, Audi and Nissan have signed up to Android Auto and It should start to appear in cars later this year. Meanwhile, Microsoft is also working on its own in-car connectivity system. It’s currently a concept and no launch date has been given. Microsoft’s Steve Teixeira, however, described it as ‘a concept we’re working very very seriously on’. There’s very little detail yet on how these systems will be installed in cars, or what effect they’ll have on the second hand car market, but presumably each car will support all systems and drivers won’t have to choose their car based on their current phone.